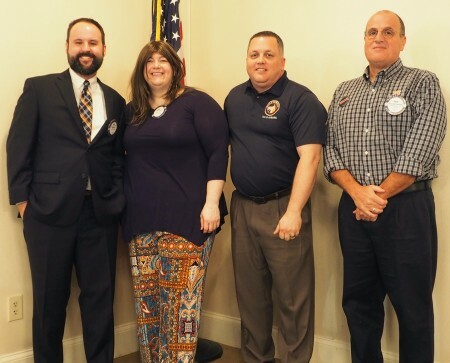 At its meeting on Wednesday, Nov. 8, the Auburn Rotary Club commemorated Veterans Day by hosting two of its own: Dr. Jenny Robinson (second from left), an associate professor in Auburn University’s Department of Psychology, and Capt. Paul “Puck” Esposito, USN (Ret.) (far right), current director of Auburn University’s Veterans Resource Center. The pair spoke about the club’s newly formed Veterans Committee, which supports and promotes the contributions of servicemen and servicewomen whose commitment and devotion make our community a great place to live. They were joined by Mark Elswick (third from left), who spoke to Rotarians about his time in the Army. Pictured with them is Club President Chris Warren (left). The Auburn Rotary Club meets each Wednesday from noon to 1 p.m. at Saugahatchee Country Club. For more information about the Auburn Rotary Club or how to become a member, visit https://www.auburnrotaryclub.com.